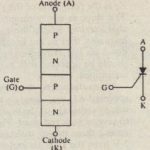 A photo diode is a PN junction constructed so that it can be exposed to light. When reverse biased, it behaves as a photo conductive device because its resistance changes with light intensity. 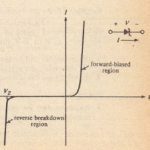 In this case, the change in resistance manifests itself as a change in reverse leakage current. Recall that reverse leakage current in a conventional diode is due to thermally generated minority carriers that are swept through the depletion region by the barrier voltage. In the photo diode additional minority carriers are generated by light energy so the greater the light intensity, the greater the reverse current and the smaller the effective resistance. Figure 18-26 shows a family of characteristic curves for a typical photo diode. For a fixed value of reverse bias (along a vertical line), ihe magnit ude of the reverse current increases with increasing light intensity. Along a line of constant light intensity, there is relatively little change in reverse current with increasing reverse voltage. Equation 18-30b shows that the collector current in a phototransistor is directly proportional to I,,, which, as in the photodiode, is proportional to light intensity. The advantage of the phototransistor is that it provides current gain and is therefore more sensitive to light than the photodiode. It is used in many of the same kinds of applications as photodiodes, but it has a slower response time, on the order of microseconds, compared to the nanosecond response of a photodiode. The phototransistor is constructed with a lens that focuses incident light on the collectorbase junction. Some are constructed with no externally accessible base terminal, and others have a base connection that can be used for external bias purposes. Figure IR-28 shows the schematic symbol and a typical set of, output (collector) characteristics for a phototrnnsistor. Notice the similarity of these characteristics to those of a conventional transistor. Lig,ht intensity in milliwatts per cubic centimeter serves as the control parameter instead of base current. The photo trannsistor whose characteristics arc shown in Figure IX-2S is to be used in the detector circuit shown in Figure IK-21)(a). When the light intensity falls below a certain level, the collector voltage rises far enough to supply the 100 p.,A of gate current that is necessary to turn on the SCR. Find the value of Rc that should be used if the SCR must lire when the light intensity falls to 10 mW/cm’. A pltoto darlington is a photo transistor packaged with another transistor connected in a Darlington configuration, as studied in Chapter II. Figure IX-3~ shows the conliguruion. With its large current gain, the photo darlington can produce greater output current than either the photodiode or phototransistor and it is therefore a more light-sensitive device. However, the photodarlington has a slower response time than either of the other two devices. Figure IH-3J shows typical manufacturer’s specifications for photo diodcs, photo transisrors, and photo darling tons. Compare the response limes and sensitivities for these devices. Note, for example, that the response times of the photo diodes are all J ns, compared to rise and fall times on the order of 2 ~s for the photo transistors and 15}-ts for the photo darlingtons. On the other hand, the light currents range from only 2 }-tA at 5 rnW/cm” for a photo diode to 25 mA at 0.5 mWfcm2 for a photo darlington. Note also the very small dark currents of each, in comparison to the values of light-generated current.